Pony, the international footwear company, staged a relaunch in 2004 with a series of controversial if puzzling photographs designed by Fred & Farid. 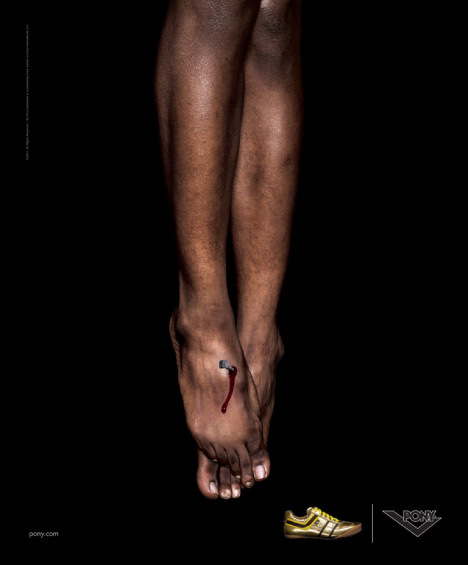 Included in the set of print ads was this “Black Jesus”, feet nailed to a cross, set with gold running shoes. “Black Jesus is the strongest statement we found for this “Hip-Hop” brand. It’s saying: “Why should God be always represented by a white guy?” In some ways, it’s a very politically correct ad. More shocking than this picture is the fact that most of the churches around the world still have only a white man as the representation of God. It’s also a reflection of the open-minded philosophy of the Brand. It’s even more fair considering the fact that most of the sports gods and hip-hop artists in the teenagers bedrooms are Black. This ad will run everywhere except in the US market. Some Americans are too puritans to be honest”.